King of Bikes is an exciting motorcycle game where your main objective is to reach the end of the track. But, it won’t be easy! The tracks are filled with jumps, loops, giant hammers, dragons, and other spectacular obstacles. You start the game with only one motorcycle but you can use the money that you earn to unlock others. Collect coins that can be used to unlock more powerful bikes is require to pass harder levels. There are spectator stunts you can perform. Each one of your bikes has its own features. 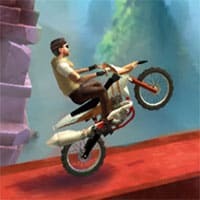 To pass the hardest levels you’ll need to use the best one that can help you do some spectacular stunts. So enjoy and have fun in playing King of Bikes Game.